Huesca vs Rayo Vallecano. Starting lineups. Both managers made no changes - and on paper that made sense. Míchel's side had won 3-1 against Cultural Leonesa and Rubi's side had won 1-0 against Valladolid. This was an evenly fought game - one could even argue that Rayo were on top - but Huesca won for two reasons: an 18-year-old's excellent performance, and a Rayo substitution that hurt themselves. Huesca lined up in a 4-2-3-1 hybrid. Up front, 6'3" striker Ezequiel Rescaldani played almost a man-marking game against Dorado, largely winning that battle and keeping him occupied in the air. Similarly, Cucho Hernández played a man-marking game against Moreno on the right - and was perhaps Huesca's man of the match. Not only did he work extremely hard when not in possession, he kept making runs between Moreno and Dorado and gave Rayo a torrid night. On the left David Ferreiro actively dribbled towards the center areas of the pitch, but was effectively dealt with by Velázquez. 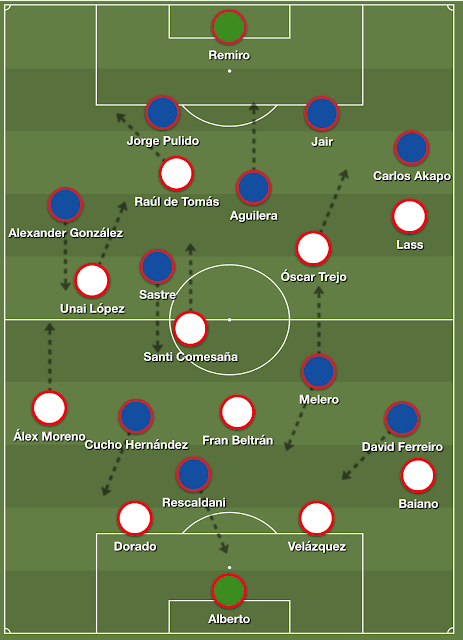 In midfield, Juan Aguilera often dropping deep to distribute the ball, and Lluís Sastre often making runs forward to overload Dorado - a tactic which Santi Comesaña tried his best to overcome by tracking his runs. This often meant that Gonzalo Melero was left to stay between the lines and provide the killer through ball. And he did so often - in the 26th minute, after a corner had been cleared, he passed the ball to Pulido but the defender's first time shot from just outside the box was parried away. Huesca's goal came from Melero too - and it was a beautiful team goal that summed up Huesca's game. In the dying seconds of the first half, Aguilera picked up a loose ball and passed it back to Pulido. 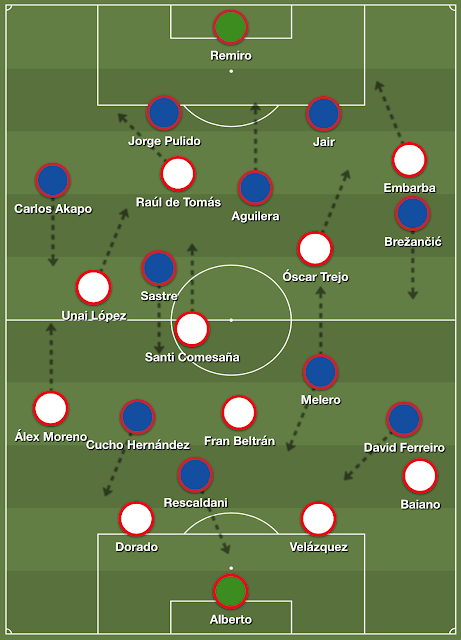 His long ball to Cucho was eventually picked up by Ferreiro and then by Melero, who dropped a shoulder and two touches later was past three players, opening up a passing option to Cucho on the right. Cucho's cross was struck home by Aguilera, bringing the scores level to 1-1. Huesca's defense gave me mixed feelings. 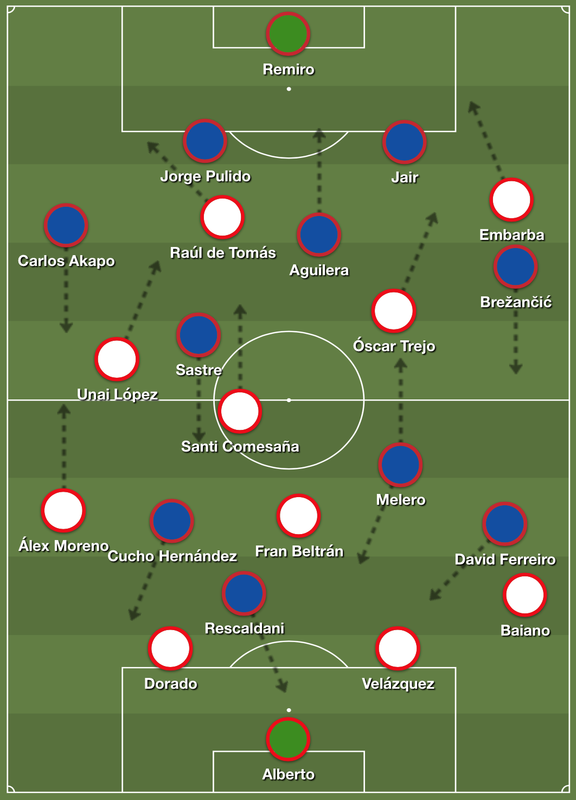 Carlos Akapo initially lined up on the right and kept Unai at bay, with Jorge Pulido and Jair restricting Raúl de Tomás and Óscar Trejo to long shots respectively. They were defensively astute, and recovered from mistakes quickly. In the 30th minute, Embarba pounced on a bad pass from Aguilera to Pulido but was immediately forced to dribble his way to the left wing - and eventually out of trouble. However, Rajko Brežančić at left back played extremely high up the pitch, which allowed Rayo to create several chances. In the 15th minute, Embarba was allowed free license to cut in from the right and his curling shot was saved by keeper - the ensuing corner caused the penalty that Trejo converted. It is here where I must applaud Rubi. In the 36th minute, Embarba, who had earlier picked up a knock in the 10th minute, was taken off for Lass. With Brežančić also getting injured, Rubi deliberately waited to see who was coming on. As soon as he knew it was Lass, he shifted Carlos Akapo to the left and brought on right-back/right winger Alexander González. This forced Lass to play deeper, given Carlos Akapo was more cautious going forward. It also had the knock on effect of Unai being forced to track back more. Huesca vs Rayo Vallecano. 38th minute. That didn't stop Lass, however, from being a nuisance. In the 48th minute, Lass dribbled past Akapo and Aguilera and passed to Trejo, whose shot was just wide of the mark. In the 49th minute Lass crossed to Unai on the left, who held the ball and released it perfectly to Moreno - his shot required an excellent save from Álex Remiro. At this point, Rayo were in the ascendancy, and really should have gone 2-1 up - in the 53rd minute Santi dribbled past Pulido and was one-on-one with the keeper, but took his shot too late and it was parried. If there is one moment this game turned from Rayo's to win to Rayo's to lose, it was the 59th minute, when each side made a substitution. Striker Rescaldani, who had picked up a knock in the 54th minute for a mistimed challenge on Fran Beltrán, was taken off for right winger Álex Gallar - Cucho played up front but from the left side. At the same time, Fran Beltrán was taken off for Trashorras - a substitution that on paper looked like Míchel wanted to slow the game down. And Rayo did slowed down. Huesca vs Rayo Vallecano. 59th minute. 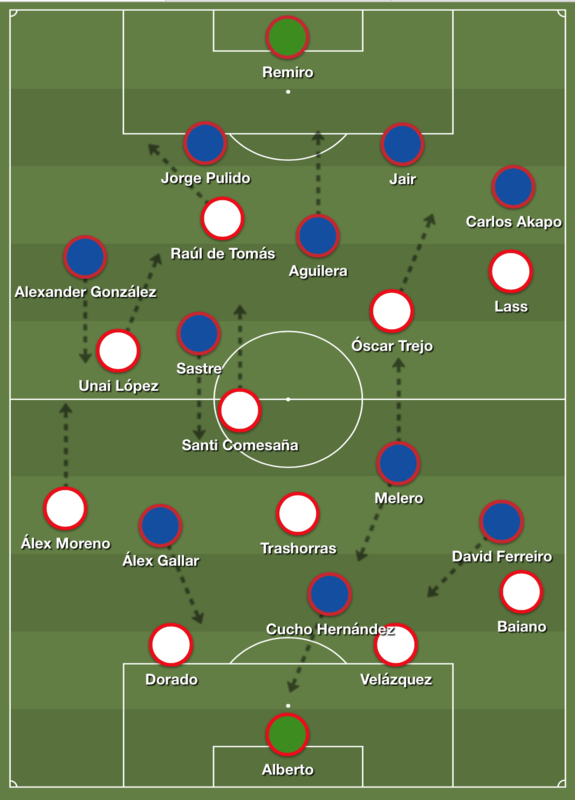 While Trashorras was effective at spraying passes towards the wings, it proved futile against a resilient Huesca defense. 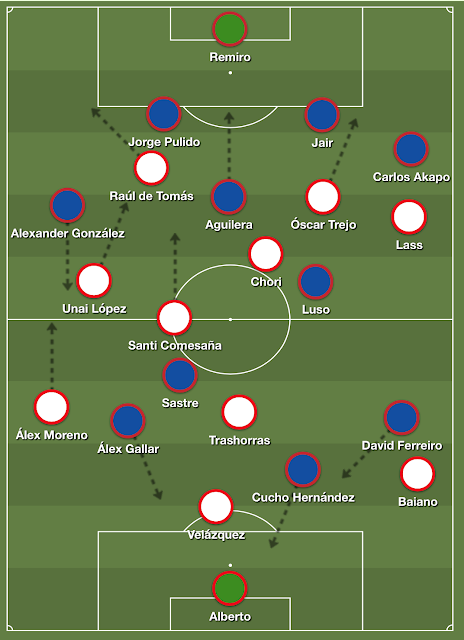 But it meant that Rayo had lost their midfield presence, and Huesca kept peppering shots at Rayo and getting past their defense. By minute 70 Huesca were relentless, and their 79th minute goal was no shock. Carlos Akapo dribbled past three Rayo players on Rayo's right side, passed the ball into Gallar, who passed it to Cucho for Huesca's second. At this point, the game was over. In the 81st minute Míchel brought on Chori for Dorado, who sat in front of the Rayo midfield, but it only exacerbated Rayo's problems. Not three minutes later Cucho's chip over the keeper was cleared off the line by Moreno. In the 85th minute, Luso came on for Melero, with Sastre acting as a number 10 and harrowing Trashorras, which meant Rayo didn't have another crack at goal. Cucho even won a penalty in the 88th minute after being fouled by Velázquez, but missed it. Huesca vs Rayo Vallecano. 85th minute. Rayo really should have capitalized on their chances, and were unlucky to not score more. However, the same could be said of Huesca in the second half. Which leads me, as a Rayo fan, to painfully admit that Trashorras' legs are no longer suited for the regista role. Funny how life works out - it was Míchel who Trashorras replaced as a left winger during the 2011-12 campaign, a campaign that ended with Míchel retiring. Five campaigns later, Míchel has replaced Trashorras. That is not to say that Trashorras is finished. Perhaps he could play further forward, with Fran Beltrán sweeping from behind. But it is official - Rayo are playing a more frantic, hectic, enjoyable-to-the-neutral type of game. And perhaps, just perhaps, that's not necessarily a bad thing. As for Huesca, credit to Rubi for being incredibly reactive to Rayo bringing on Lass - if he hadn't waited we could have seen Luso play one of the full back positions and this could have been a different game. But credit also goes to Huesca, who were strong in almost every department - and that's before you realize the players who didn't even play. Álvaro Vadillo, Kilian Grant and Chimy Ávila didn't even make the bench - and that's just the attacking firepower.